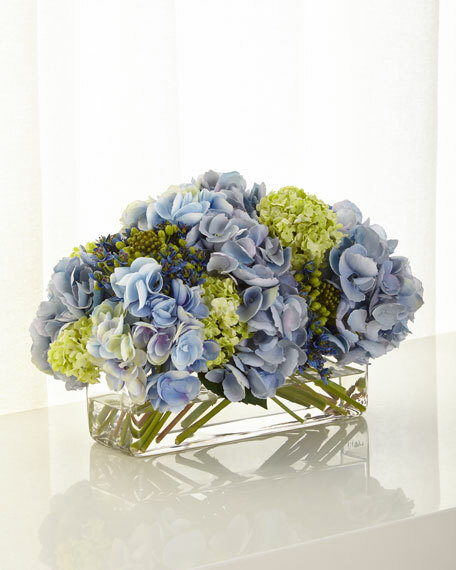 Coastal blues come alive in this lush bouquet of hydrangea, agapanthus and snowball arranged in a low glass rectangle vasegreat for a console or dining table. Luxury floral arrangements handmade to order in the USA from the finest materials. Handcrafted faux-floral arrangement in glass container. 17"W x 10"D x 10"T.
Diane James has been creating the most beautiful floral arrangements and orchid plants for us since 1997and not one of them has ever wilted. Her designs look so real, they are the accessory of choice for top designers all over the world. Diane developed her passion for flowers while living in Europe, mastering the art of floral composition with Lady Pulbrook, the doyenne of English design, and more recently with Kenneth Turner. She turned to "faux" in the 1990s when asked to create lasting arrangements for her clients' vacation homes. With the help of her twin daughters, Carolyn and Cynthia, Diane designs a seasonal collection, inspired by the latest home decor trends and embodying her signature "just-from-the-garden" style. For in-store inquiries, use sku #2536743.